OK, so most of you know me by now and understand the I hold a high level of nutritional integrity. You may wonder what I mean by this. To put it simply, this is my typical nutritional plan. Based on my general meal plan and overall health plan, I will share that my mental/emotional health and clarity is very strong and my memory is definitely above average. My energy is typically high physically, mentally and emotionally during most moments and I sleep well, while waking ready to rock and roll. Well with that said, I will share that I performed an experiment the past 6 days. I went back to the Chicago area to visit my family and friends for a 6 day trip. During this trip, I made the choice to try some old food favorites from back in the day. Here is a list of some of the foods I experimented with. Now when I was not eating or drinking the above foods I was making the best choices available. I stopped at Whole Foods and picked up some organic free range fertile eggs, kombucha and some filtered water. I brought with me some raw soaked almonds and when I was out, I did make positive choices when I was not experimenting with the (SAD) foods above. So what do you think was the response to my experiment? Well number one, even though I still went to bed early most evenings and had adequate sleep, I never felt completely rested. I did not wake with that same vigor. I also had a tough time maintaining energy through the day and was often exhausted into the evening. My bowel movements, while normal in regard to quantity, were definitely challenged in quality. I was bloated with consistency. My memory was severely challenged. Heck, I had to call my bank to let them know I was out of state on vacation to allow use of my credit card and I couldn’t remember my street address to save my life. I also noticed that I was not the same man emotionally. I felt as if others thought I was a crab a_ _ at times. All from 9 poor choices over a 6 day period! Overall I think you can see the effect that just a small amount of the (SAD) can have on your sleep, your energy, your digestive system and your mental/emotional health. I remember the day that I had the gyro plate with fries, it was so yummy that I took the left overs back to eat the next day. When I spent the entire day belching up the gyro, I threw it out because I simply could not go through that again. So here are the key points to understand. 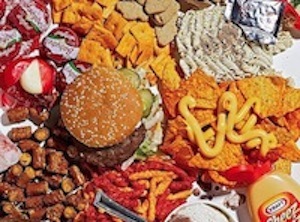 The standard American diet (SAD) in even very small amounts on a consistent basis is very detrimental to your health. It is so important to make a commitment to quality nutritional choices at least 90% of the time. Think of it this way. If you eat 3 meals per day, which is what I would typically recommend, you would consume 21 meals in one week’s time. 90% would be eating quality foods, right for your Nutritional ID, for 19 of those meals. The other 2 meals, do what you want. Be open to some of your old favorites as long as they do not contain intolerant foods, such as gluten if you have a gluten intolerance. This creates a freedom and removes the restrictions that can stifle most. When you begin eating in this way and your energy, physically, mentally and emotionally improves on every level it then becomes easier to make your own choice to cut back on the challenging meals for yourself. You’ll begin to get addicted to feeling good! Thankfully, I am on the plane and heading back to California. Can’t wait to get back to my regular eating plan and feeling amazing! While some of those old favorites still taste so good, they simply are not worth the pain and discomfort. The taste of some of our poor quality nutritional favorites does not come close to the way amazing feels! If you are already eating well and feeling the benefits of this, please pat yourself on the back and be an example for so many others. If you are eating the (SAD) let my experiment be a lesson for you and understand that there are some incredible levels of health waiting for you simply by improving your digestion and eating well. I wanted to share a late entry to this article. Remember, I originally wrote this on my plane ride back to California. Well, after being back a few days, I found myself challenged with a bacterial infection that I picked up somewhere during my travels that really took me down for a few days. Do I think this was a coincidence or did my poor choices leave me suspect to this? I think you already know my answer to this. If you would like to learn more about improving your digestion, assessing food intolerance or assessing your Nutritional ID, register here for a complimentary 20 minute phone conversation with me personally. As always, if you have any comments or questions in regard to the article, feel free to post these below for me to answer personally.